Tis the season to be watching Christmas movies! 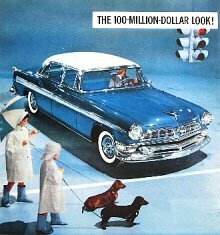 We watched "The Lemon Drop Kid" with Bob Hope the other night and to our mutual amazement there is a very funny scene with a long-haired wiener dog in it! Perhaps you already know about this, but it took us by a nice surprise! 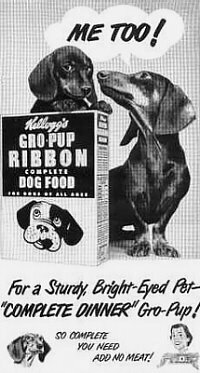 The voice-over did not sound very like a Dachshund barking but we'll excuse them this considering how sweet a film it is. 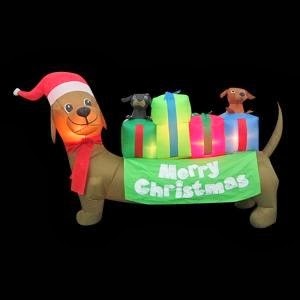 If you want to check out the Dachshund scene, and we know you do, click on this youtube link, we've got it all queued up to start at the very best part. 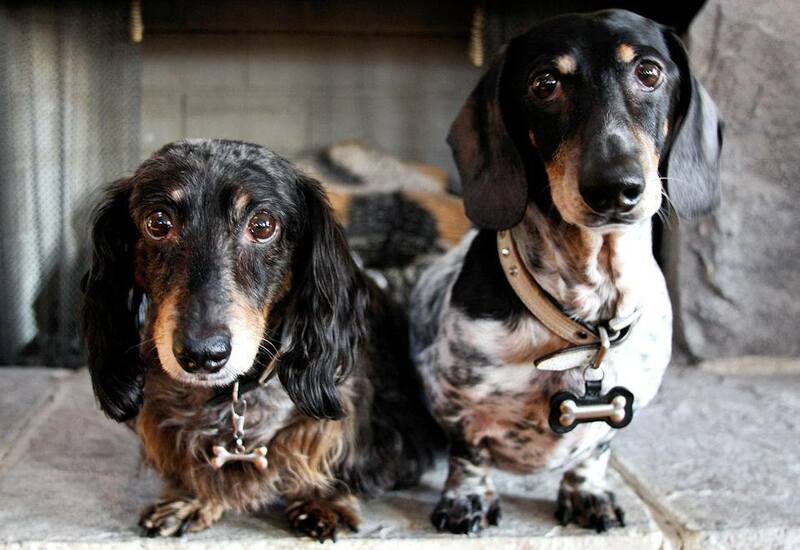 Big ol' film-hound rescue 'Scooby' is the newest member of his pack. Ain't he a handsome boy? Congrats to his family! 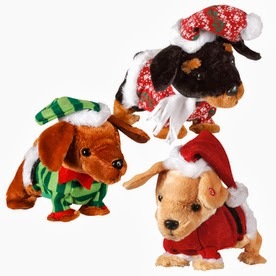 'Mason' and 'Kai' picked up their fashionable holiday attire at their local K-Mart. 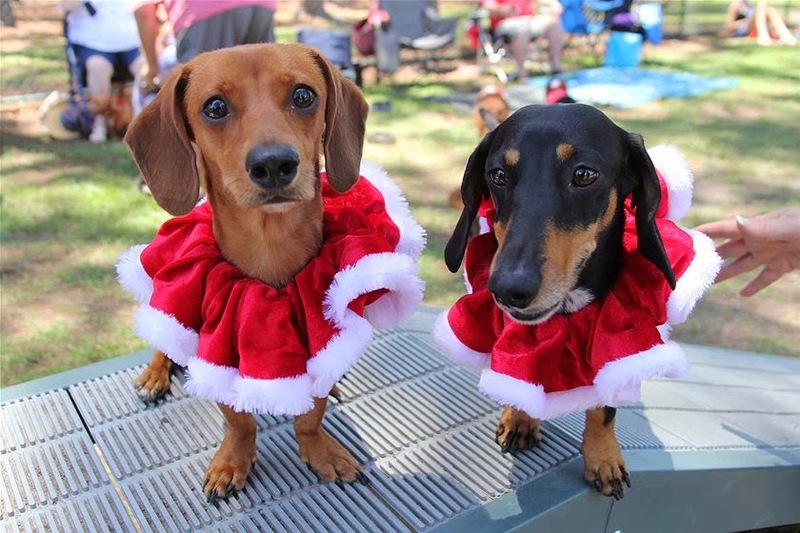 Dozens of Dachshunds recently got together to enjoy the warm weather and celebrate Christmas Down Under at the annual Dachshunds in Paradise holiday meet-up in the Gold Coast, Australia. Dachshunds in Paradise is a local meet-up group which "gathers to celebrate their petite pups and to raise money to help find homes for neglected dachshunds." Read more, see more pics, and hear audio from the event at ABC.com. 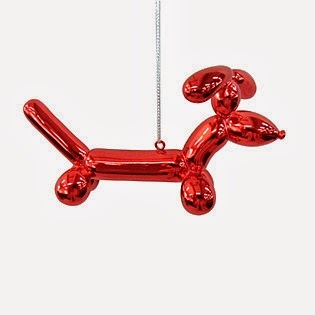 We're sure that you remember handsome little 'Portillo' the Wiener Dog via Modern Doxie Chat a few months back in March. 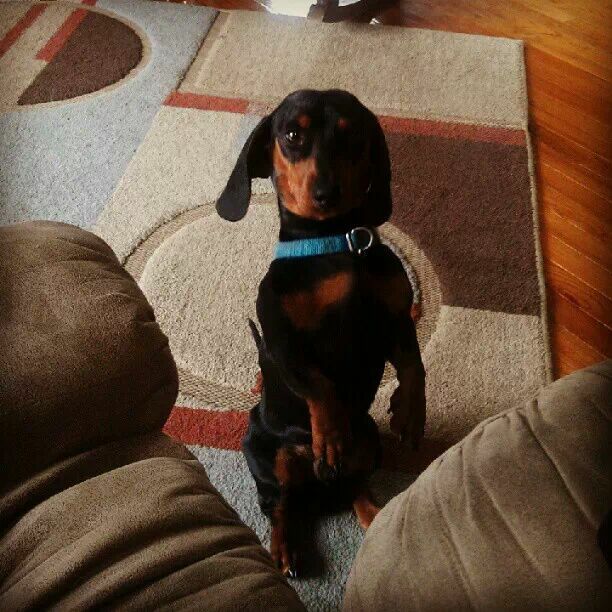 His human, Greg Miller, has a new format for his vlog show, and thankfully, Portillo makes frequent appearances. 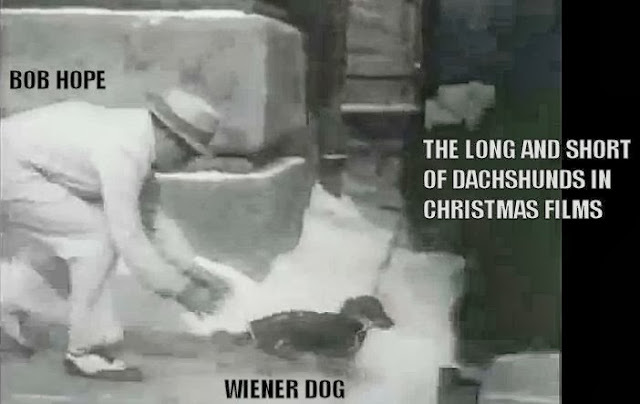 In this episode, we get to learn all about the little guy. 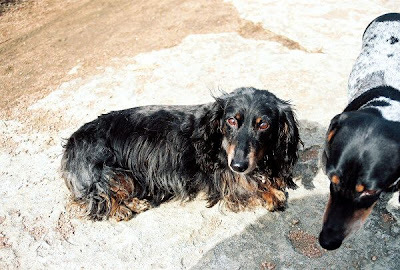 Rounding out this retro weekend at The Long and Short of it All, here's that Flipper episode you thought you had just dreamed about - the one with the smooth black and tan Dachshund swimming with our aquatic Lassie. 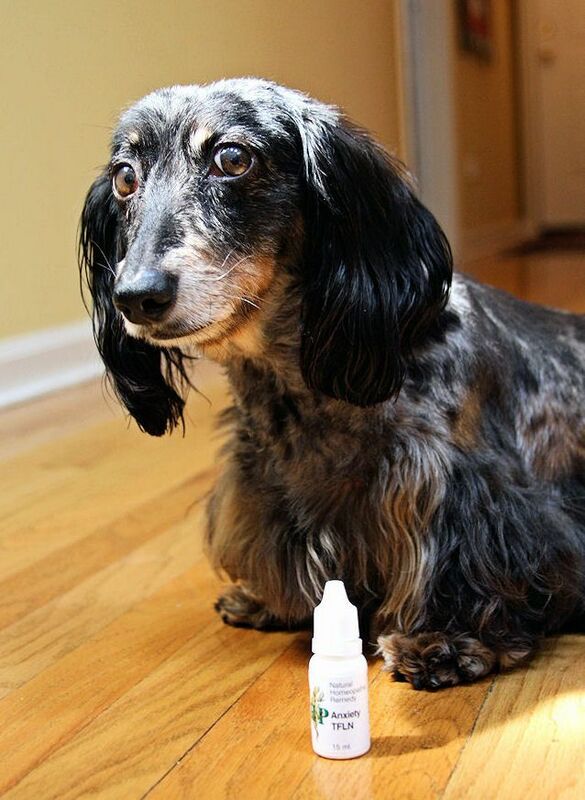 You weren't dreaming - it was as real as the whiskers on your furry little schnoz. Video by youtuber Doria Biddle. Can I lend you a paw? 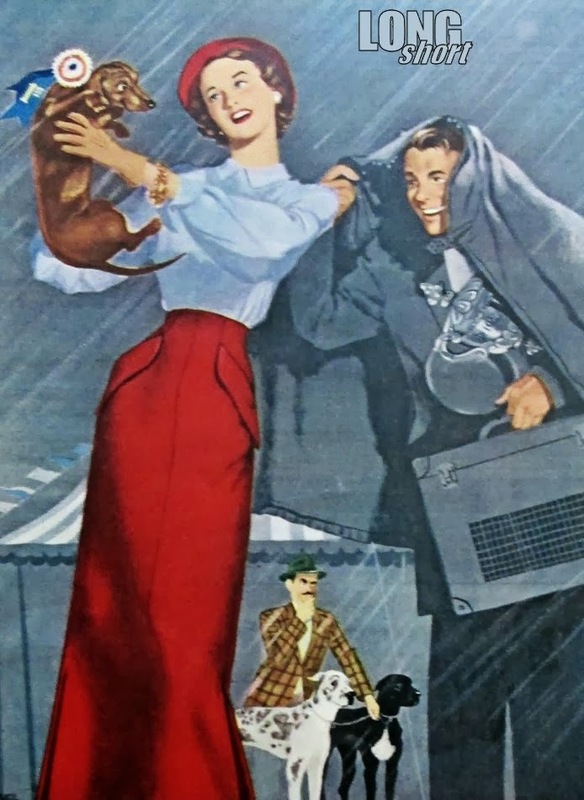 I recently stumbled on this while looking up some information about the holiday movie "Susan Slept Here" starring Debbie Reynolds. It turns out that the movie’s director remade the film as "Bachelor Flat" a few years later in the early 60s. One of the roles in Bachelor Flat is played by 'Jessica' the Dachshund. The whole movie isn’t on youtube, but this is a great clip of her and a dinosaur bone. 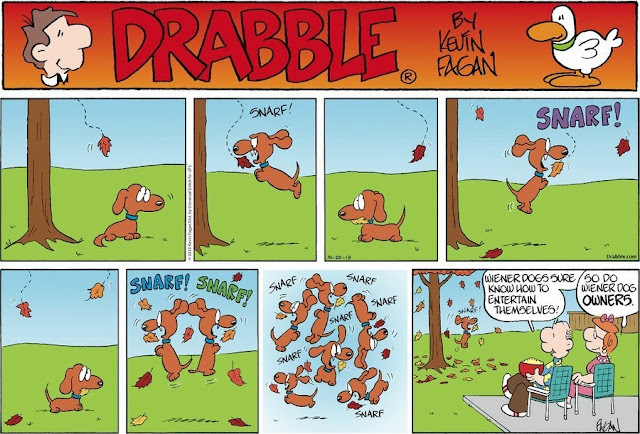 What would a small dog do when confronted by a huge bone? Jessica, btw, is billed in the opening credits. A charming British anthropology Professor Bruce Patterson (Terry-Thomas) has to live with Helen Bushmill (Celeste Holm), his fiancée. Helen is away traveling, and has failed to tell him that she has a seventeen-year-old daughter Libby (Tuesday Weld), who shows up at her mother's home unaware that Helen is engaged. Meanwhile he has to resist the advances of the neighbourhood ladies who barge in unexpectedly. At the same time, Patterson must deal with the continual invasions of his cynical neighbor, and law student, Mike (Richard Beymer), who soon develops a crush on Libby. 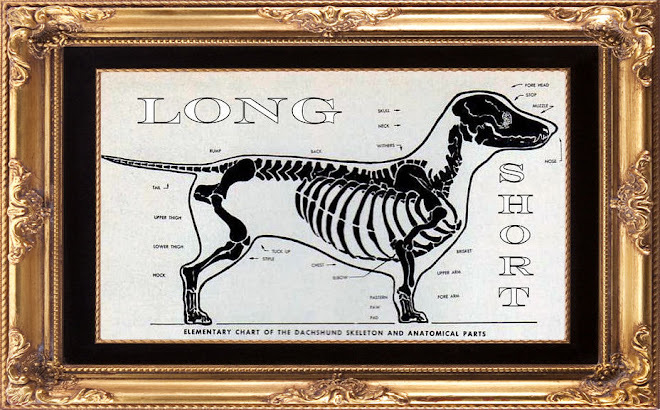 Intertwined in the story is Mike's persistent Dachshund, determined to bury the professor's prize possession of a rare dinosaur bone. 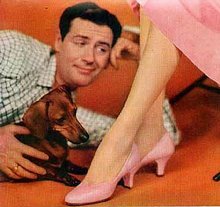 Director Frank Tashlin said he included the Dachshund as a satire on CinemaScope due to the dog's shape. Better get this film on your must-watch list! At the time Variety called it a "frivolous, farcical concoction" and credits much of the great comedy to the supporting cast. 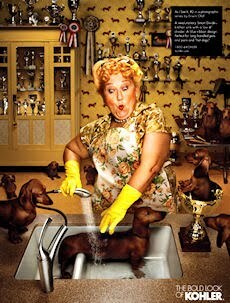 They added "The Dachshund, incidentally, is an accomplished low comedienne." Of course she is. 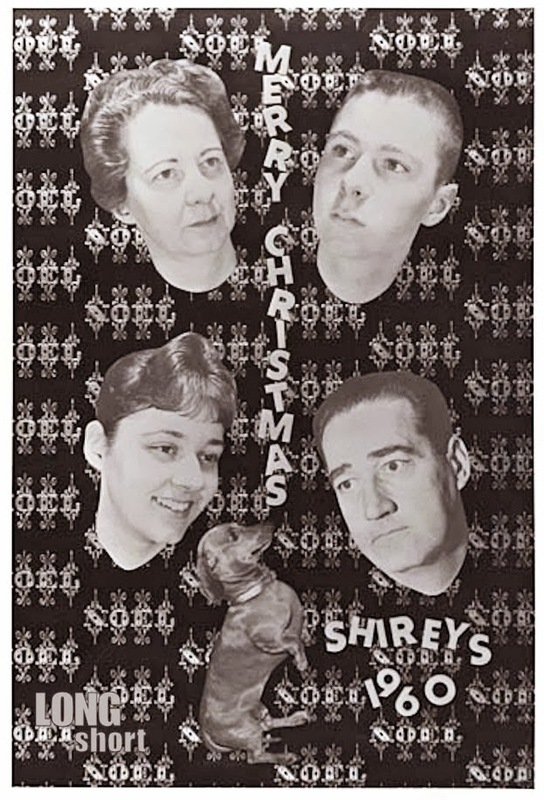 Everyone looked forward to The Shirey's Christmas Card each year. 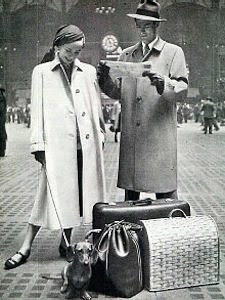 Have you got yours all ready to go? 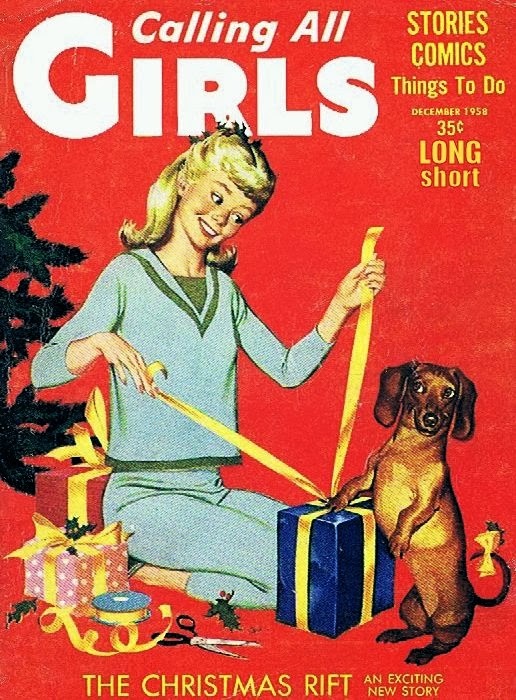 Original Dachshund Christmas Card by The Shireys, probably America, circa 1960. In case you missed it, some feisty Dachshunds - 'Guinness' and 'Stella' - were recently on The Late Show with David Letterman. Like Mr. Letterman said "God, that was nice." Have a great Friday - it's time to smile! She sure plays it cool. We interrupt our unfortunate hiatus with this festive advertisement of the season by Mr. Porter, the "online retail destination for men's style." Thanks to 'Joe Cocker' for sending this in! Please pardon our absence as of late, but we've had some family emergencies in the last few weeks and haven't been able to provide any updates. We haven't even been near a computer for weeks on end. 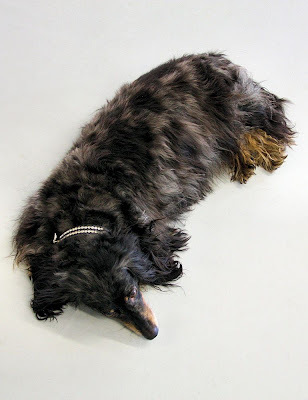 Things are not good, although thankfully they are improving - Dachtober, so much to answer for. 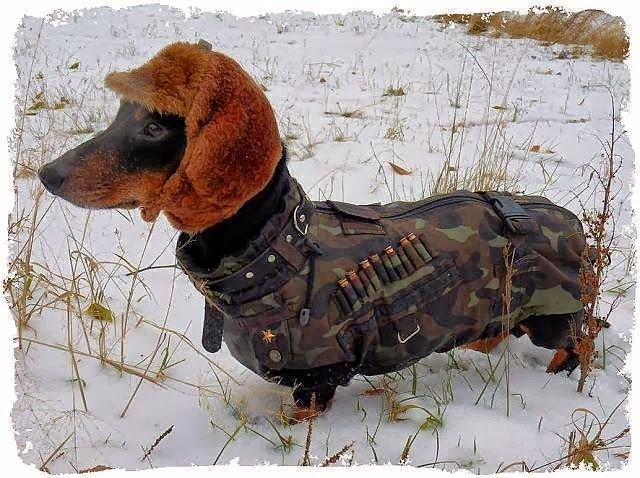 But today is Veterans Day 2013, and as we have done on Memorial Day and Veterans Day for all of our years here at The Long and Short of it All, we take time to honor those who served in the armed forces - and the Dachshunds who stood by their side. Sgt. Adolph Sweeney, a distinguished "war hero," was called front and center again today - perhaps for the last time - to receive the accolade of civilian Long Island. Voters named him Pet of the Year in Newsday's annual Golden Collar contest. 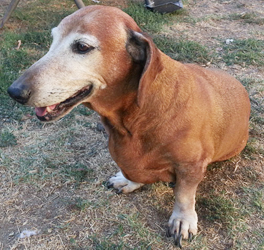 The 17-year-old Dachshund-Beagle, who suffers from serious heart trouble since an attack last March, apparently won the hearts of voters. They gave him more than triple the votes of his nearest competitor, the tiger-cat Mr. Peepers. Adolph, owned by Stephen Sweeney, a chauffeur of 30 Madison Ave, Franklin Square, New York, brought to this year's competition an exciting war record. He flew 39 World War II missions over Germany with his master, a veteran of the Army Air Corps. 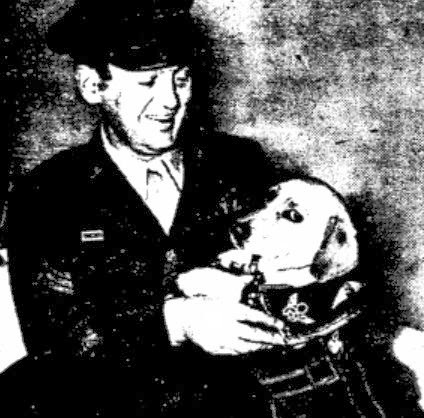 Adolph was presented with the same medals that Sweeney earned: the Air Medal with five oak leaf clusters, the Distinguished Flying Cross, and other citations. As mascot of a B-17 Flying Fortress, he logged 800 hours flying time from bases in Italy, England, and North Africa. 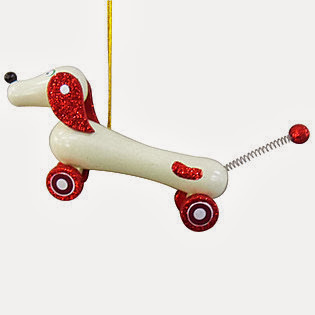 "But this award," said his master yesterday, "is the best. It gives me something awfully nice to remember him by." In the last few years, Sweeney explained, Adolph's health has slipped badly. "He lost his hearing completely two years ago," Sweeney said. "Then that heart attack in March. He just won't be around much longer, that's all." 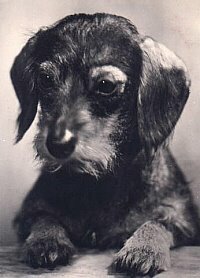 Adolph's age is comparable to 84 years of a human life, it was estimated by a spokesman at Farmingdale Animal Hospital. Largely on the basis of his dramatic story, Adolph was selected by Newsday judges as the sixth Pet of the Week. Then readers voted him Pet of the Year. 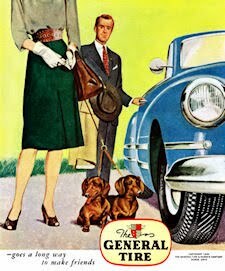 He will receive a solid gold collar to mark this title. 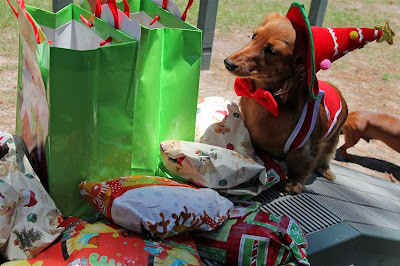 By Stacy Jacob Photography, who notes: What can be cuter than this little guy, so full of love to give. 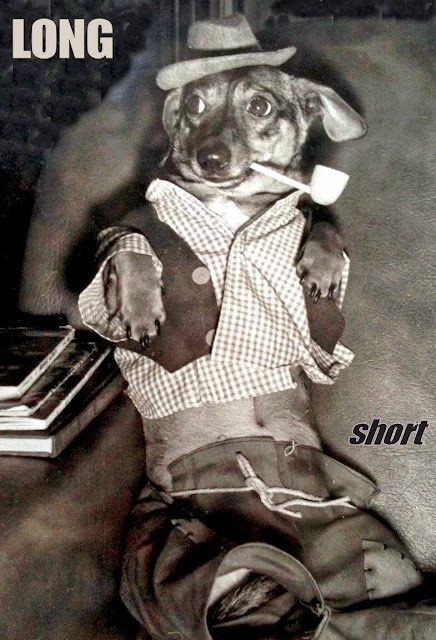 And such a smart cookie, he sure knew how to pose for the camera. I think my favorite thing was his reaction to his "Sandwich Kiss". 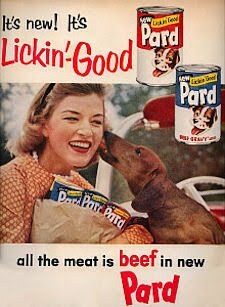 We've no idea of the original source of this fine photo making the rounds on the interweb at the moment. Is it yours? 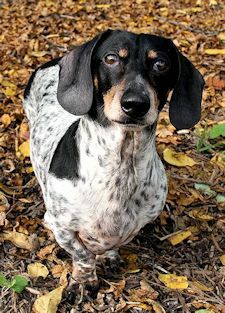 Our hearts go out to the family and friends of 'Weenie,' a troubled little guy who got the short end of the stick last week while incarcerated at the Harlington Humane Society in Harlington, Texas. 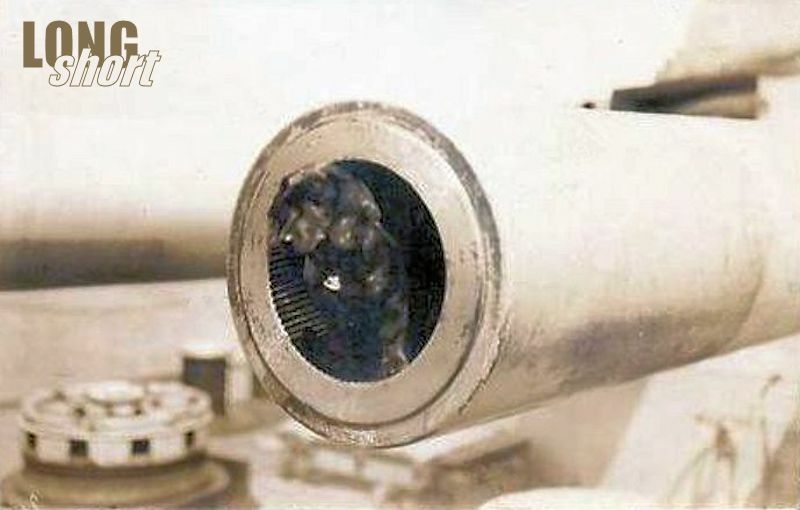 We understand that mistakes are made, but what a tragedy. Thanks as always to the incorrigible Princess Lea, who hails all the way from Slovenia, for sending in the latest Drabble! She says: Here's Wally to brighten the week ahead! 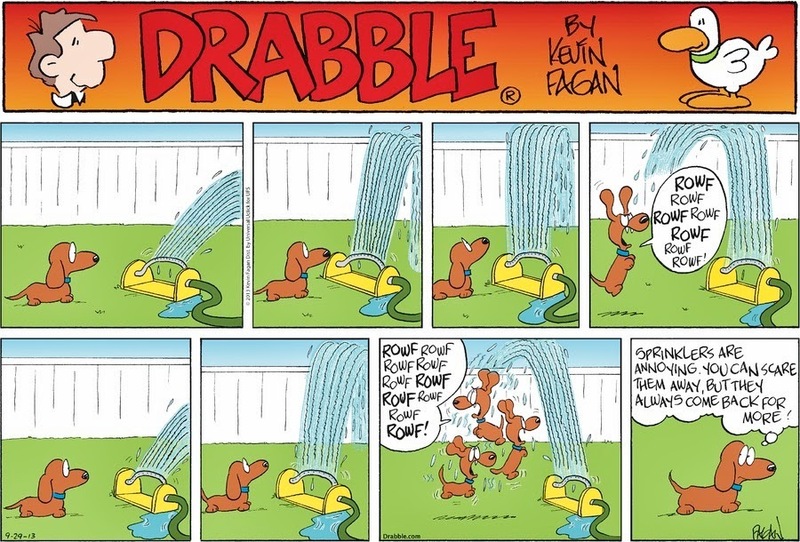 Did you know Wally's got a new book out? 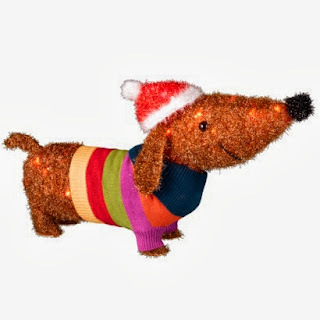 We thought you might want to know about all the fun Dachshund stuff out this Holiday Season and do some shopping. It appears Dachshunds are taking over Christmas this year! Above, you'll need to head to the yard decor section of Home Depot to find these handsome accoutrements. 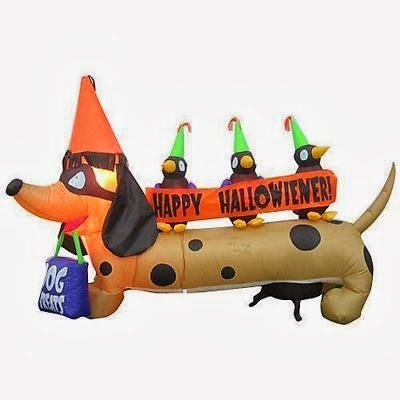 And More Walmart Yard Decor - if you're still looking for Halloween! 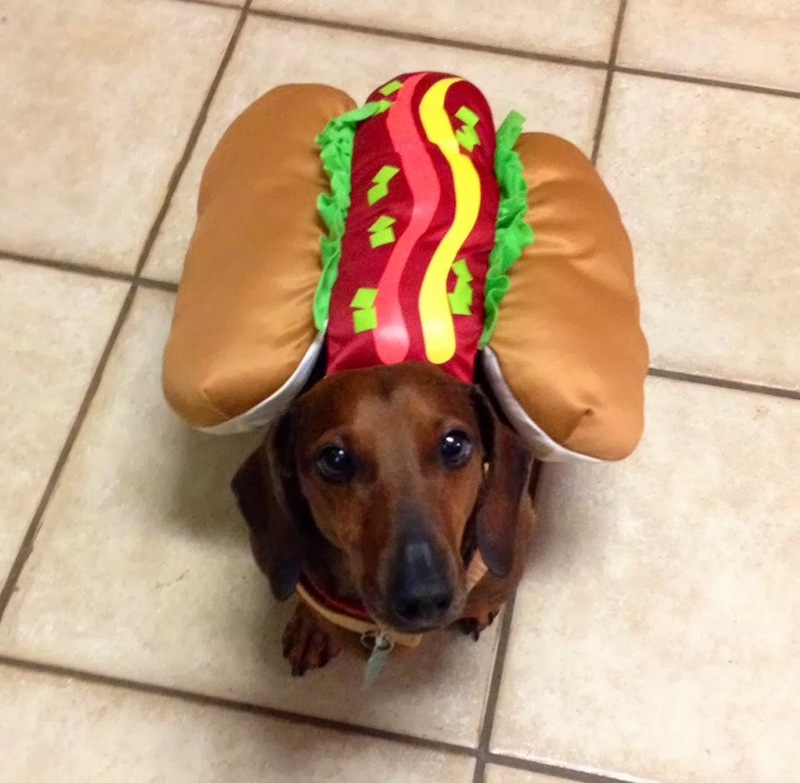 When we had our video blooper "little wiener" last week, I had a lot of folks tell me it would go viral. Little did I know what viral REALLY meant. We've lost count of how many radio stations (especially national shows) across the country. 1.8 million websites in the past 7 days! 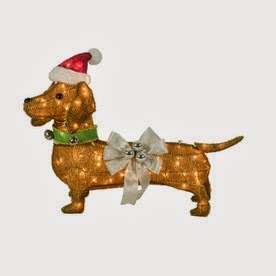 And see....like all good Wieners, Mr. Prater's Dachshund 'The Colonel' DOES get dressed up! 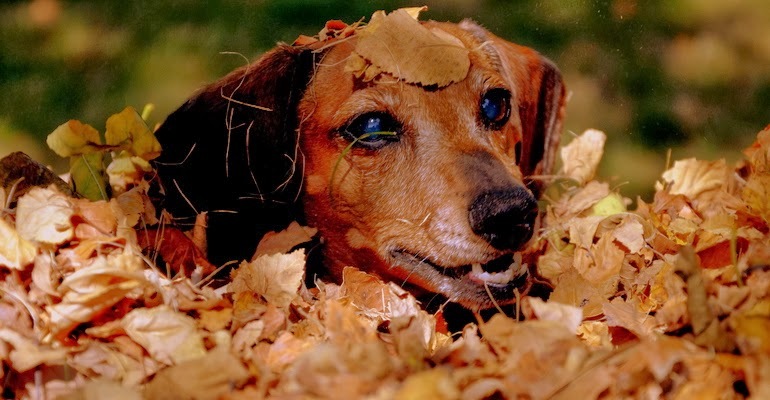 Via the Chicago Sun Times: Fall leaf pile in Naperville, Illinois: There is nothing like making a leaf pile. Now that my girls are too old for this, my dachshund, Rosie, keeps looking forward to the leaf pile, her rite of fall. Let's delve into the private insecure world of 'Pickles,' shall we? 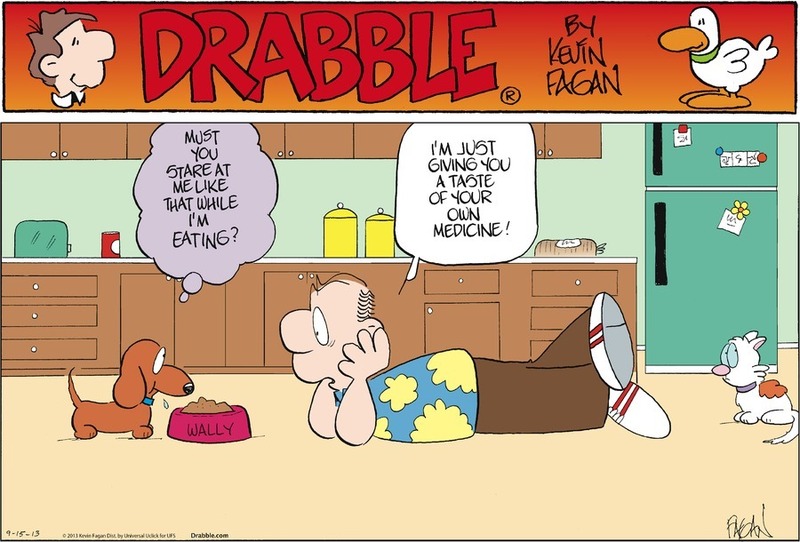 Thanks as always to our pretty pal 'Princess Lea,' who hails all the way from Slovenia, for sending in the latest Drabble! She says: "Wally Style!" 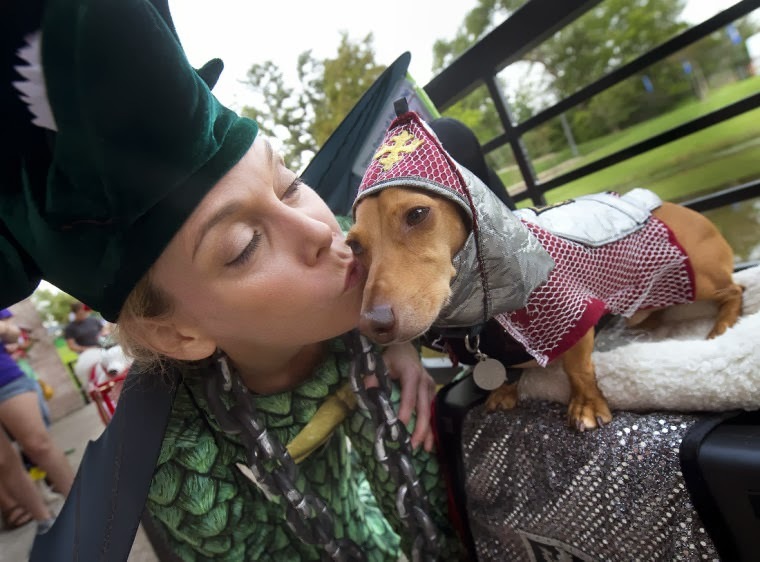 Dressed as a dragon, Laura Price plants a kiss on the cheek of her knightly Dachshund, 'Henry,' before competing in the costume contest at the Aggieland Humane Society's Wiener Fest 2013 at Wolf Pen Creek in College Station, Texas, on Saturday, October 5th. 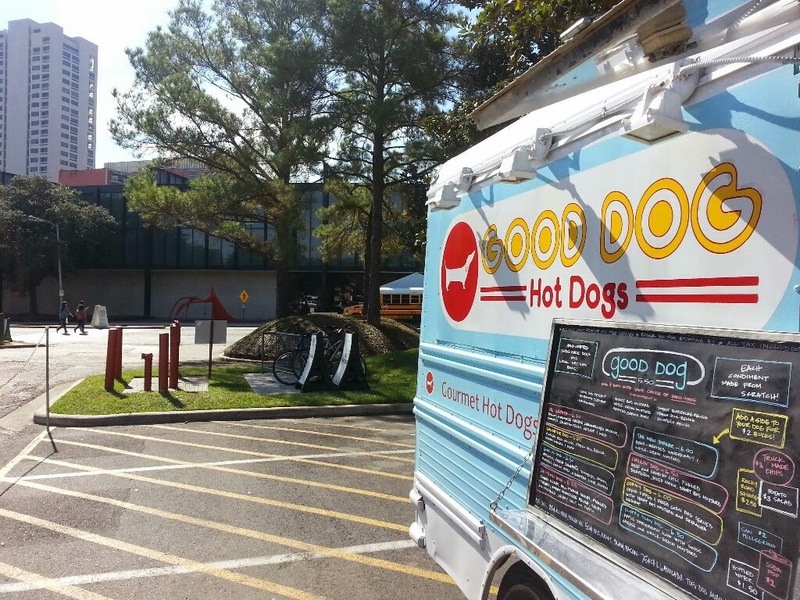 The event, a fundraiser for the organization, featured live music, vendors, a 5k run, "wiener" and "Wanna be a Wiener" races and more. 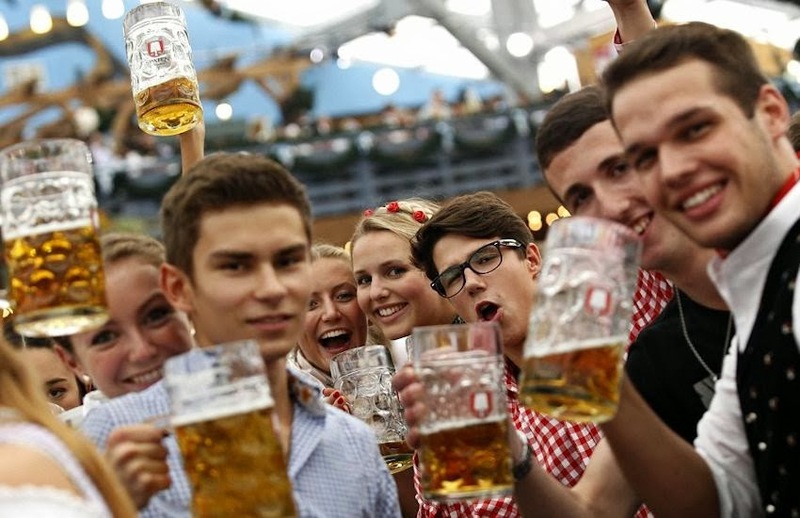 Check out all the fun photos at The Eagle. 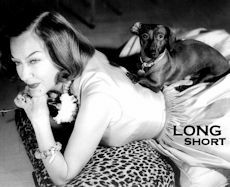 Your Long and Short of it All hosts 'Bette' (left), and 'Rowdy' (right). Well, Hello! 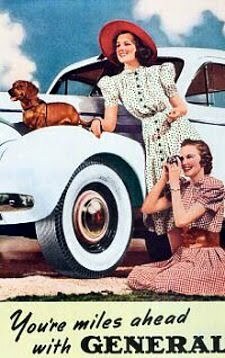 Please excuse our absence, but we are currently vacationing at Chicago's exclusive Chez Schiro Salon and hope to be back online in a few days' time. We hope that your Dachtober is going as swimmingly as ours. 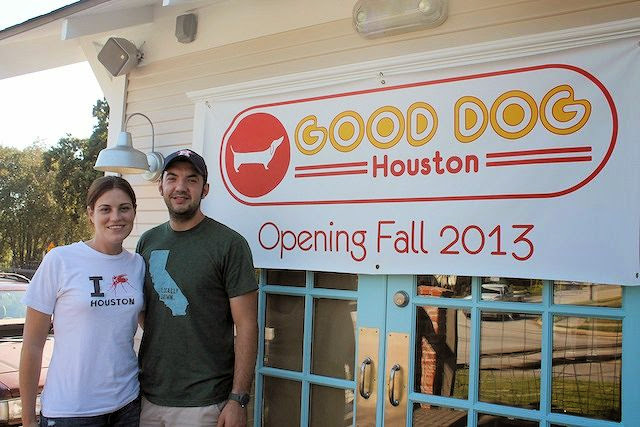 If you live in Houston, Texas, you won't want to miss the opening of Good Dog Hot Dogs later this month. Owners Daniel Caballero and Amelia Pferd have been operating out of a food truck for a few years, but are now opening a brick and mortar restaurant for their gourmet hot dogs on artisan buns. 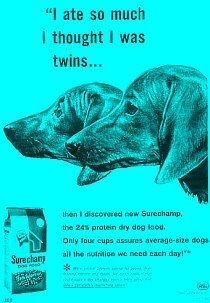 Dang, now we're hungry again and we just had breakfast 10 minutes ago. Find out more at The Leader News. 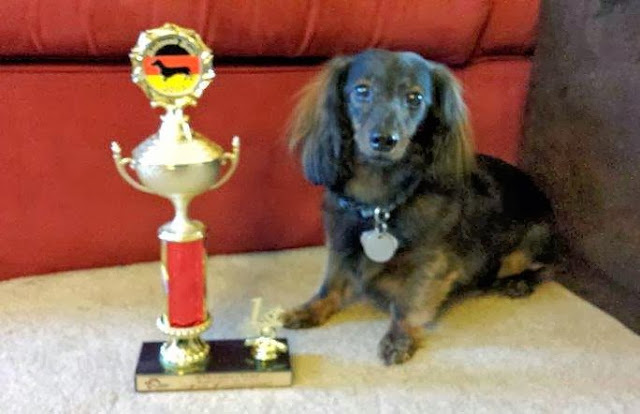 Congratulations to little 'Gracie,' who took the grand prize at her local Dachshund Dash this last weekend near Colorado Springs, Colorado. Way to go! She ran her heart out in honor of long-time Long and Short of it All reader and older sister 'Piper,' who left this earth last Wednesday. Our hearts go out to Gracie and her family. 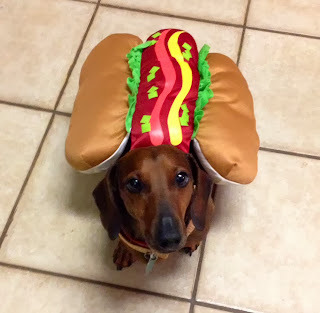 Welcome Dachtober! 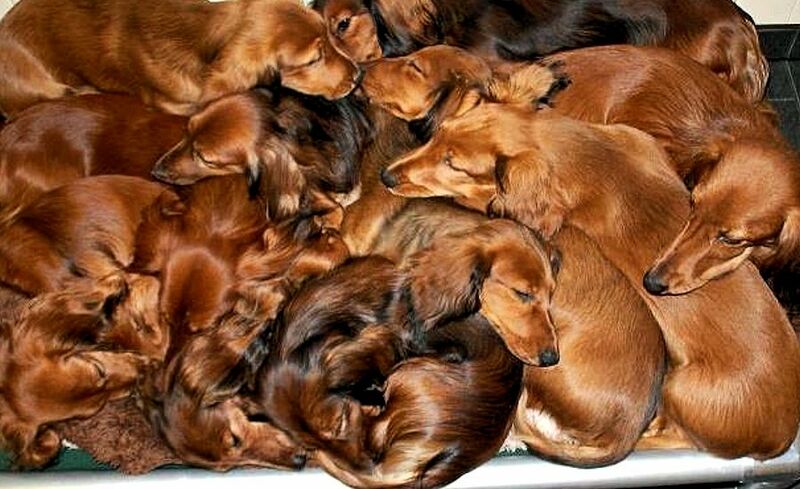 Stand strong little Dachshunds, it'll all be over soon enough. It's a hard-knock life. By vimeoer Annie Dubois. Thanks to the incorrigible Princess Lea, who hails all the way from Slovenia, for sending in the latest Drabble! 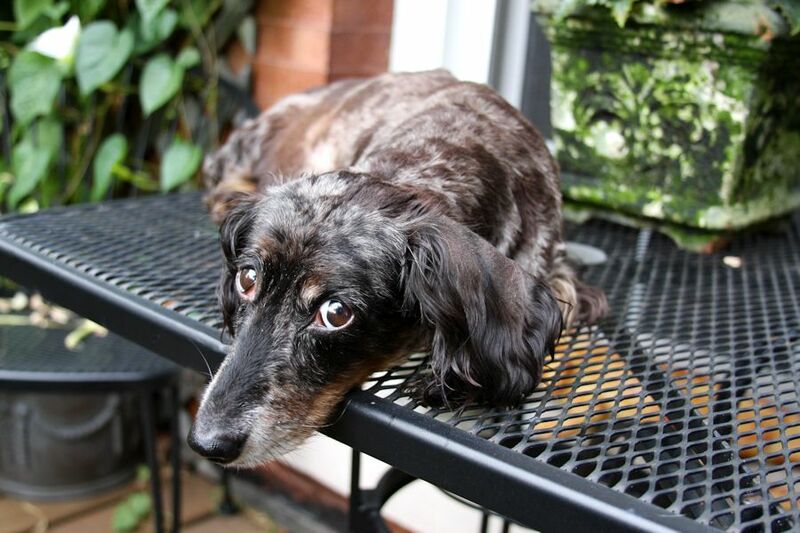 She says: Here's Wally to cheer up your Monday…have a great week! PENN HILLS, Pa. —It took more than two hours, 15 grown men, shovels and floodlights to free a 4-year-old dachshund trapped under a retaining wall. The efforts on Clematis Boulevard were praised with applause after Precious, the healthy but shaken dog, was freed from a groundhog hole. Precious was let outside for a bathroom trip, but her owner Abby Hile said the dog took off for the back yard and went into the hole. Hile said she tried for an hour to coax the dog out but she wouldn't budge. Hile called 911 for help and the Penn Hills Station 227 volunteer firefighters arrived with the essentials: floodlights, shovels and a love for dogs. "We had to remove some of the wall. The difficult part was digging and trying not to collapse the hole and cut off her air supply," said Fire Chief Randy Dolton. Oxygen and a camera from the sewage department were on standby. But after more than two long hours, the volunteer firefighters got their first glimpse of Precious and let her owner pull her free. "There's no way I could've gotten close to doing that by myself. She's part of the family. She's definitely part of the family so we're very happy she's OK,” said Hile. "I have dogs so I know how it is. They're like part of your family. You hate to lose a pet. It's a happy ending," said Dolton. How many more days until our favorite month? 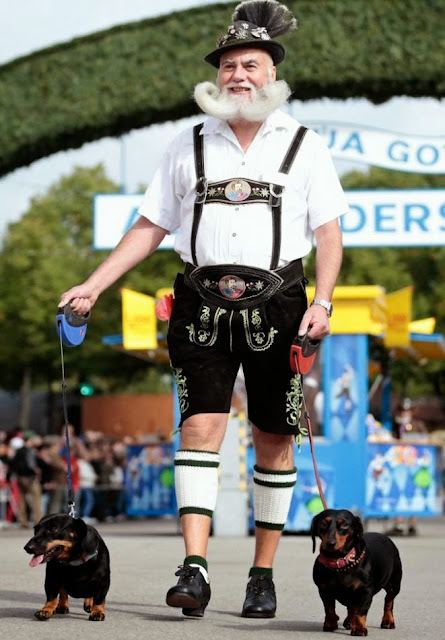 Thanks to an Anonymous Dachshundist for sending in this photo via The Daily Mail where, they document some pretty amazing photos of the Oktoberfest kickoff in Munich, the Motherland. Don't miss them. 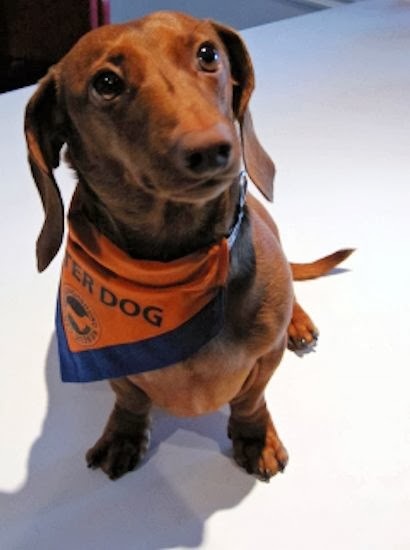 Ninety-six Dachshunds sprinted down a track outside the Ronald Reagan Building and International Trade Center in a series of races to raise money for the Washington Humane Society on Saturday in Washington DC. 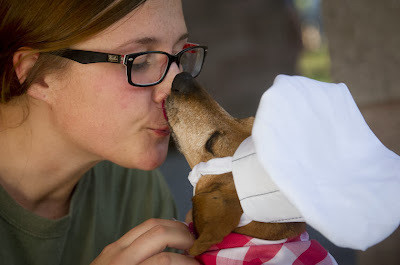 The 2nd Annual Wiener 500 Dachshund Dash, organized by OnTap Magazine, was expected to raise more than $2,000, according to event officials. 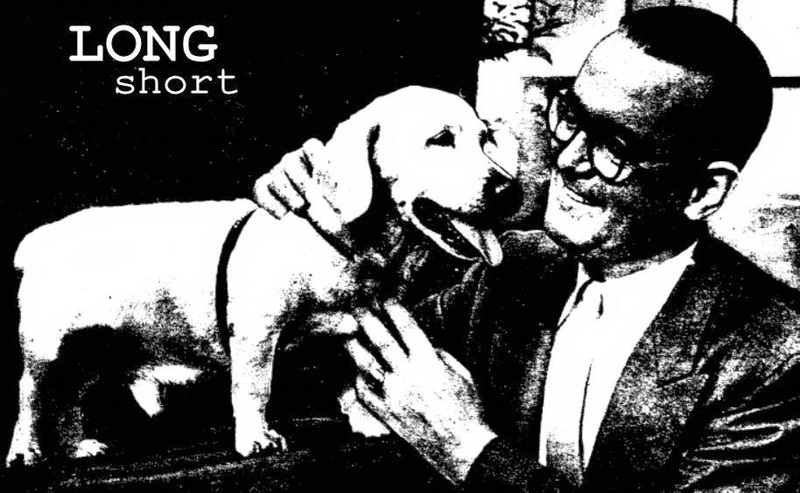 After a brief rain delay, a dog named 'Pumpkin' won the final race and was crowned champion. Way to go Pumpkin! Via the GW Hatchett. PACIFIC FABRIC - The skirt with winning ways! Pacific's Stabilized Gabardine that's stain, crease, and shrink resistant - about $11. Rain won't stain it. Sitting won't wrinkle it. And its new slim lines stay slim and trim. At leading stores throughout the country. 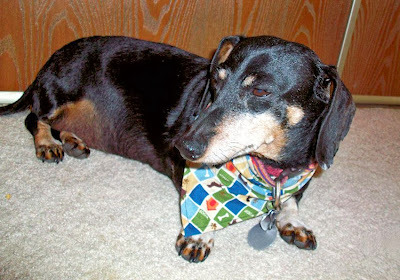 In a follow-up to this week's story on Bradley, the Michigan Dachshund who fearlessly gave his life for his humans when a bear approached them, here's another interview with the humans in his life. Via UpNorthLive. 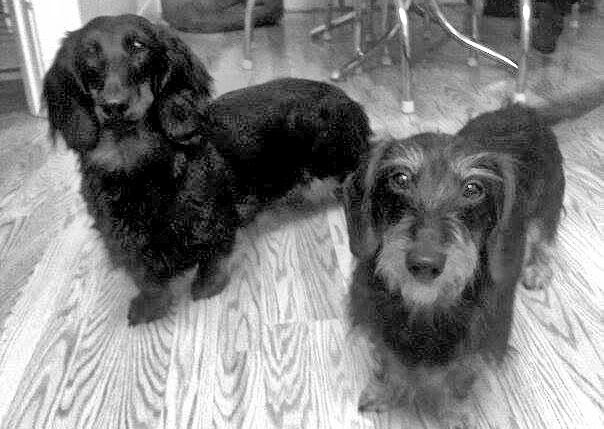 If they could talk, the wiener dogs in the care of Canadian Dachshund Rescue would tell you that being ridiculously cute has its drawbacks. For one thing, it tends to obscure some of the unique characteristics specific to the breed that require firm and knowledgeable training in puppies to produce well-heeled adults. 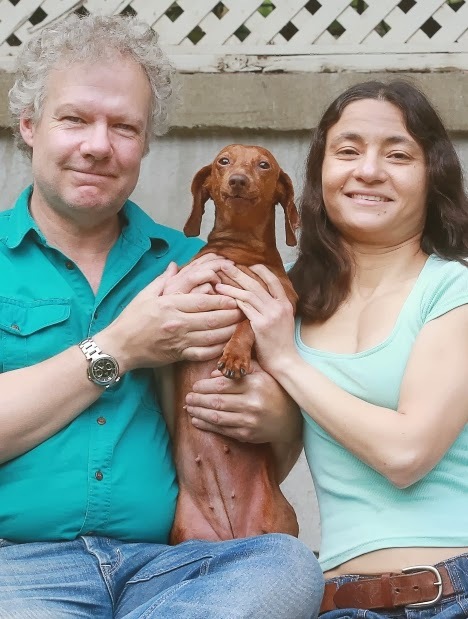 “Every breed has its challenges,” Meaghan Middleton-Firman, vice president with Canadian Dachshund Rescue’s board of directors, tells Samaritanmag. 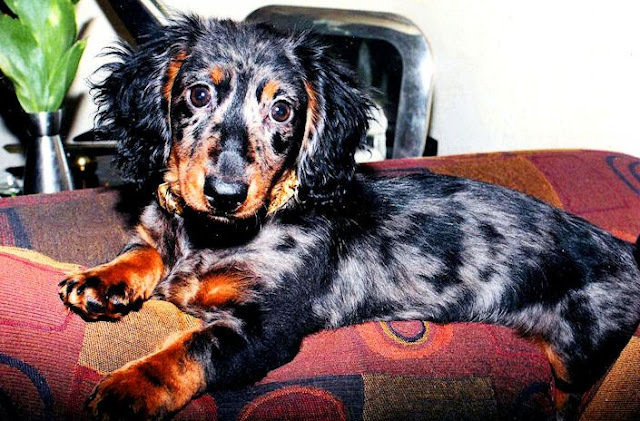 “But dachshunds are cute, tiny dogs and people get them because everybody loves wieners. Kids stop us on the street to look at them. 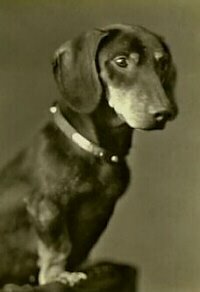 “What people don’t realize is that dachshunds are hunting dogs; they are the only breed meant to hunt above and below ground. So they’ll go face-first into a badger hole, and then bark loud enough that their owner can find them while they’re underground. They are tenacious and loud. Read more at Samaritan Magazine. Thanks to our pretty pal Princess Lea for sending in the latest Drabble all the way from Slovenia! 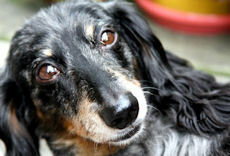 A dog being called a hero tonight, credited with saving the lives of two men when they were caught off guard by a bear. Bradley, a Dachshund, put up a fight against the bear on Saturday in Oscoda County. While he didn't survive, the two men who were with him say because of him they did. The two men from downstate were visiting their friend in Comins. They say despite the large bear being feet away from them, it didn't scare the small dog one bit. "We came out in the golf cart, and this bear was standing right there," Mike Hodges recounts. Hodges, who suffered a stroke just three weeks ago, says he and his friend Jeremy, didn't notice the bear right away. Bradley's owner, says the dog certainly did. "Bradley jumped off the golf cart and attacked the bear, and the bear grabbed Brad and took off," owner John Force explains. "He grabbed him up and took off running through the woods with two other bears following 'em," describes Mike. They believe the bear was startled by Mike, Jeremy, and Bradley, and was trying to protect it's cubs, and when the bear reacted, Bradley was simply trying to protect the two men he had only just met that day. "I think when Brad saw it, he did what he would normally do, jumped right off it and went at it. I wouldn't have ran after that bear with a knife as big as I am, and little Brad- 4, 5 pounds- he don't have a filter for fear," John says. The two men eventually scared the bear away with a stick and loud noises. They brought Bradley back to the house, and the dog was rushed to an animal hospital, where he died. 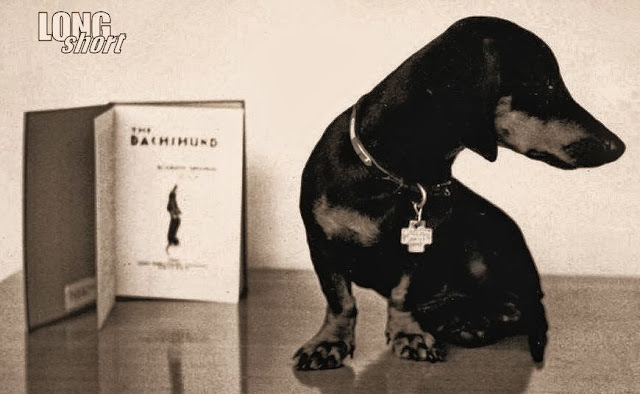 "He was a warrior," John speaks highly of his dog, "if he would have died any other way than that, you know, it was a noble death the way I look at it." John believes his dog's fearlessness changed the outcome of what could have been an even more tragic situation. "Mike being in the medical condition he's in, I don't think he would have been alert enough to get away from the bear. I think Brad did save them from getting mauled at least," says John. John says he and his family are proud of what their dog did, and know Bradley would do it again. "It ain't the size of the dog in the fight, but the fight in the dog that counts, and that sums it up for Bradley." He was Handsome. He was Bradley. Via Ishai Sagi: Sesame and Chickpea do not like a bath, so we make it fun for them by giving them rubber ducks to balance on their heads. WOOHOO! We're having a great time now! Hope your Monday is just as super. Engagement photos are known for being posed and -- if we're being completely honest here -- kind of awkward. 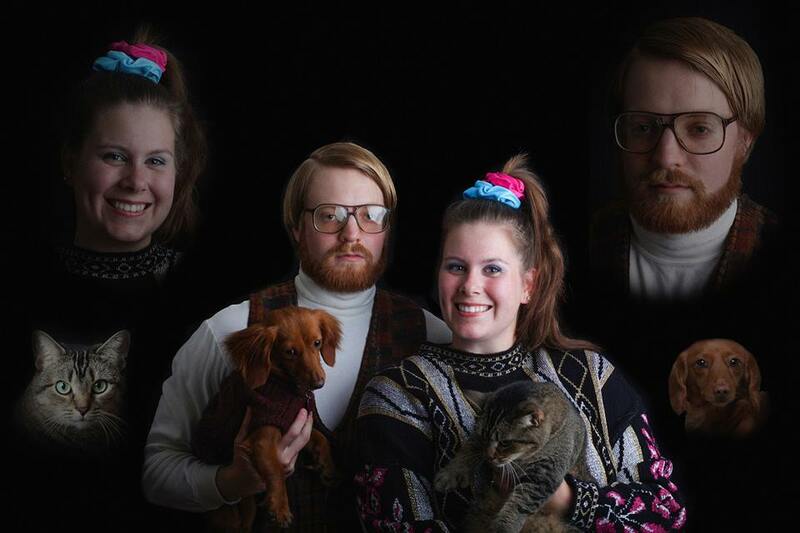 But one Connecticut couple, Magdalena Niziol and Peter DeLong, decided to embrace that fact in their pre-wedding portrait -- complete with ugly sweaters, 80s-style scrunchies and some apathetic-looking pets. So the animal control came and took care of him. Or did they? We fail to understand why some videos go viral when others don't. It seems to us like there are so many more quality videos, like the ones we post here on The Long and Short of it All, that deserve a little more recognition. 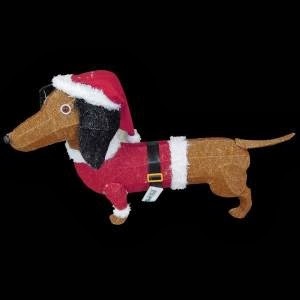 This is cute and all, don't get us wrong, but all the Dachshund lovers all over the world cringe a little when they see the little guys jumping so high into the slippery tub.